Hailing from Durango, Colorado, this product is designed to get coil-like performance from your air fork without the weight, cost, or restrictions of a coil conversion. Stop compromising, make your suspension work for you! The RUNT is an air spring system that threads into the top air chamber of your FOX 36, RockShox Lyrik, Pike, Yari or Revelation fork, replacing any volume spacers. The patent-pending design provides coil-spring-like performance from your air sprung fork, creating a near linear compression curve while maintaining infinite adjustability. Complete package - Comes with shims to custom tune your damper to your body weight for most forks if desired. Optimal Initial Stroke - Traction is dependent on your tire maintaining continuous contact on the riding surface, therefore optimally your suspension's initial stroke should be as supple as possible for small bump sensitivity. 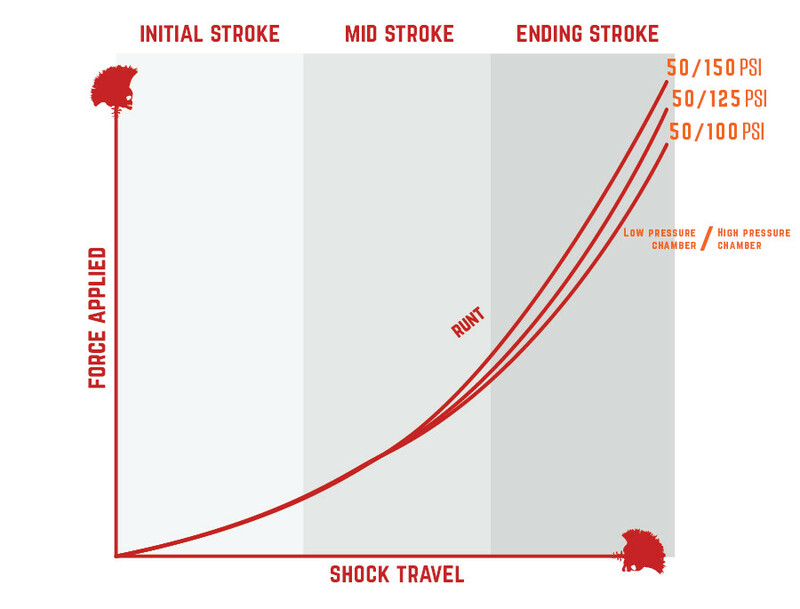 Optimal Mid Stroke - Cornering is completely dependent on support in the mid-stroke. If the suspension curve is too low through the mid-stroke, your cornering will suffer drastically as the front end of your bike will dive and your geometry will change. Proper mid stroke support also helps keep your fork from diving while descending. This helps preserve your geometry making your bike more stable. Optimal Ending Stroke - The RUNT offers adjustable bottoming resistance without compromising your initial or mid-stroke. A steady linear compression is the holy grail of air suspension. The most common problem with an air fork is the tendency to have an overly supple beginning and mid-stroke, and then a drastic spike in compression towards the end. This contributes to a less than optimal suspension set up, either sacrificing small bump plushness for stiffer cornering performance or vice versa. The RUNT solves this. As demonstrated in this animation, The RUNT is set to a specific psi. When the air spring's pressure reaches the same pressure in The RUNT, The RUNT's floating piston begins to move. This allows for a linear pressure curve previously impossible in air sprung forks. If you need increased bottoming resistance simply increase the pressure in the high chamber. Increasing bottoming resistance will not affect your initial stroke and only slightly affect the end of your mid-stroke. Q: Do I need to re-valve my damper for The RUNT to work? A: No, The RUNT works well as a drop-in and will be an improvement to your ride. That said, we have been re-valving forks for years as they are not very supple from the manufacturers. Re-valving makes your fork ride even better! The RUNT is shipped with shims to re-valve your rebound damper and/or your entire damper. On some forks the lock-out feature becomes less effective. Your local bike shop can do this for you or you can send it to us. Many riders choose to take this one step at a time. Q: Is The RUNT hard to install? A: The RUNT is super easy to install. You simply remove the air in your left fork leg, remove the top cap and any spacers or tokens, screw The RUNT in, air it up, and you are ready to ride. The process takes about five minutes. Q: Will The RUNT I buy work in any fork? A: The RUNT, unlike other options out there, is fork travel specific and was designed to take up the maximum air volume in your fork leg. We do have flat and step pistons that allow you to convert between 150mm and 160mm of travel, for example, by ordering a different piston. Q: What maintenance does The RUNT require? A: The RUNT requires very little maintenance. Once a year we suggest replacing and lubing an o-ring contained inside. That's it! I've been running one of these for about a month now. 170mm Fox 36 Grip2. At 52psi (with no RUNT) it was Ok off the top but midstroke was too soft and I could never use more than about 150mm travel even on fairly hard hits. At 45/90psi the midstroke was crazy stiff and I was bouncing off everything and it hurt my hands. At 40/80psi it was super plush and nice but used up too much travel and too much sag. At 45/70psi so far it seems just about right. WIth the runt the midstroke support is great and I also find it easier to use more of my travel on big hits, as there is less of a ramp up effect from the mid stroke to the end stroke. I don't know what the spring curve would look like on paper but suspect it is fairly close to the graphs shown above. All I know is it it feels great on the trail; more support in corners, under hard braking, and on steeps. Do you have a graph against a FOX 36 Grip 2? No the Runt has two air chambers that are never in communication with each other. This is what allows it to be so adjustable. Was it the DRCV shock that blew or was it the Full Floater that blew??? What came first ? We know the full floater link made for a very unsupportive wallowy midstroke and they are finally going away from it. Should I consider this for my kid who is 60lbs and is on a 140 Yari? It’s certainly less beneficial for a lighter rider. Also, since this acts as idle adding 5 tokens, you would be increasing the spring rate a lot, which is likely already too stiff for such a light rider. Whcih you’d have to compensate for by lowering the pressure. Then you’d end up with a mushy initial stroke followed by a stiff mid-stroke and your kid would never see the last 1/3 of travel. That’s just my opinion based on suspension theory though. It actually is more beneficial to smaller riders for the reason you just stated. The Runt works on the concept of running lower air pressure and less compression damping. Resulting in a more supple fork. 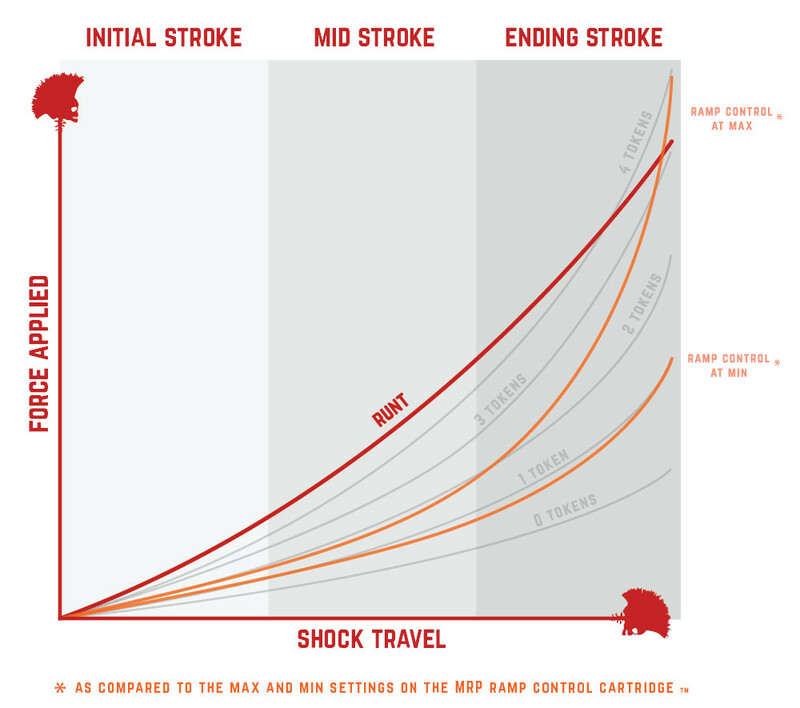 The Mid stroke keeps it from feeling mushy when running lower pressure/less compression damping. Its a smooth transition and not stiff at all when starting with lower pressure. The lower pressure does make it easier to get into the last third of the travel and its a smooth ramp to bottom out . We dont like to see all the travel used regularly because what happens when you make a mistake come up short , over shoot a landing maybe land in a hole or on a rock? Typically we like to see about 25mm left over even after large jumps or drops on to smooth transition. We set customers up this way and have been doing so for years. A few of them dont believe they will ever use full travel. However they always come back with story of almost having a really bad crash because of a mistake which eventually happens to every one. I dont care how good you are. It usually goes something like ...... "I was riding along and I over shot a jump or came up short and thought I was done !!! But I rode away from it and sure enough I bottomed out the fork and was happy I had a little travel on reserve"
Airwreck, I believe I answered your question below. Yes It turns out smaller riders are much more sensitive compression damping stiction and higher initial pressures. We have actually changed tunes and reduced compression damping after working with smaller riders and found that the larger riders benefited from it just as much. This can be done with the runt because it has enough mid stroke support to keep your fork riding high in the travel with out being harsh. I have a brand new 2019 Lyrik DebonAir at 160mm for may Knolly Fugitive. I race Enduro at a pro/expert level and weigh 187 lbs. Do you have a good base setting for me to start with? Im really interested in racing with this product as Enduro race course and my local terrain (Bozeman, Montana) are rough long and steep. Thanks! Yes we do. Your runt will ship with shims to get the appropriate rebound tune for your weight. Our instructions are posted on line to do so. We recommend running the compression all the way open. The runt has enough mid stroke support to keep your fork from diving. We don't need to rely on compression damping to do so, resulting in a more supple ride. If desired we can re-valve the upper base/compression valving to be even more supple on the charger 2( in house only). Unfortunately, Rock Shox does not support the upper half of the charger 2 damper. They don't have replacement parts or directions for it. If something is done incorrectly it could mean having to purchase a whole new damper. For that reason we only do compression valving in house. Rebound is easy to do If you are not equipped to adjust the rebound valving any good suspension /bike shop should be able to. You can run the damper stock. We are just trying to make it as easy as possible for our customers to have the best riding fork possible. Any graphs showing this versus either the vorsprung or PUSH coil conversions? Best upgrade I’ve experienced!! DSD Runt turned a fork i liked into a fork I loved!!! Highly recommend for anyone looking to bring your fork alive. I’ve tested for sram and fox and this is truly an amazing product built by a passionate human that understands the shortcomings of the current designs available. This is my 3rd season on the RUNT and I will never go back! Every iteration of the “best new bike” on the “best new suspension” ends up in Diaz’s shop for a full tune F-R with a Runt, sooner than later, because the man works magic. This product turns a high-end fork into perfection & a low-end fork into the same kind of magical bliss. The graphs point out the perks of his products, but you really have to ride his work to feel the difference. It’s palpable. He smooths out the chunk while maintaining the pop, in a way I haven’t experienced before. I’ve stopped paying premiums for the extra features on my fork & shock because they all end up Diaz’d in the end - and that’s the only upgrade that matters on the trail. Ask around... if the rider lives in the greater southwest AND shreds, they’re probably well aware of Diaz Suspension Design. Us locals bring our brand new, never-ridden bikes to Diaz on day one - new bike day - because we know it’ll be better after his tune. When will these be available for Rock Shox w/ debonair air springs? They are already Debonair compatible. Debonair air springs are much harder to bottom out. I went from 2-3 Tokens on a 2018 Lyrik to zero or 1 on a 2019 Lyric. Of course if you have an RC2 Lyric, you can open up HSC and use up the travel more easily. Will the Runt be sold through major distributors like QBP? As of now, no. We do sell directly to shops at dealer pricing. I started working on the RUNT in 2012. I believe we were selling them locally in 2014-15. We were not ready to do a large scale release till now. What is the difference with the Manitou IRT system? It's similar, just done in a slightly different way and applicable to non-Manitou forks. Yes, we can ship to the UK right now. Just put your order in and we will send it out! Wonder if there was one for a Dvo . Could it add infinite adjustability together with OTT ? We have not had many requests for DVO. I believe you're the first. We have, however, had lots of requests for a FOX 34 version so that will be added to the next run . +1 Request. Nothing wrong with any DVO fork I've owned. I am surprised no one else has jumped on board with an adjustable negative spring like DVO has been making since day 1. I would like to see how much more linear this is compared to a Ohlins RXF evo. Very similar design to the Ohlins air spring. This is amazing. I’ve been calling for this for like 5 years. Air forks have always been a compromise in setup and this is one of the best solutions. I remember when I first saw it on Fox’s snowmobile shock and new that was needed in mountain bikes. I can’t believe they have sat on the technology. It effectively allows you to properly set air pressure for preload while having midstroke support without horrible end travel ramp. Now this just needs to be incorporated into the original fork design so that the primary air chamber volume can be adjustable. That’s the only problem I see here. For lighter riders, this acts as a 3 token system, so the spring rate could be too stiff. Especially if it’s acting as a 5 token in mid-stroke. It works great for smaller riders because they can start with less air pressure and have a more supple ride yet still have support. The RUNT changes the slope of the spring rate on the graph. The most linear setup is running a 2:1 ratio of high pressure to low pressure. It will give you that linear slope whatever pressure you run. For example, our bigger customers (~250 lbs) are running about 85psi in the low chamber and 170psi in the high, while our lighter customers are running 45 low, 90 high. Don't think of tokens as bottoming resistance or firmness, because the air pressure you apply to the tokens is what makes it firm or soft. Another example is you can run 75psi with no tokens and get about the same bottoming resistance and mid-stroke support as 65psi and three tokens. 65psi with three tokens is going to be more supple at the beginning of the stroke. Hi DSD. How many tokens (lyrik) does the RUNT equal with no added PSI to either chamber? Thanks. You need pressure in the L or low chamber because that is what airs up your normal air chamber of your fork. If you don't run any pressure in the H or High chamber? The piston will get pushed all the way to the top and I am guessing it would be about 1 token for the piston and the RUNT body. Given the stiction of an IFP design, is there any noticeable notchyness that develops over time? I'm used to it at the beginning of travel - might feel weird in the middle. No notchyness. The IFP is not in direct contact with your fork lowers, therefore we were able to design the o-ring gland with a little more squeeze to ensure a long reliable o-ring life. It's also a standard size o-ring that should be available at any good hardware store and is very easy to replace if needed without any special tools. I believe that there is a lot of hype behind bladders. There really is not that much friction coming from an IFP. In a damper, there is a hydraulic advantage to move the IFP and it's not in direct contact with the lowers of the fork. Because of this, if there is a little friction at the IFP vs the shaft seal of a damper the shaft seal is going to be much more noticeable. The shaft seal also has to hold much more pressure than an IFP because on the rebound stroke is where all the force/pressure is being applied to, vs the IFP or bladder the force has been dissipated from having to pass through the base valve or compression stack before moving the IFP or compressing the bladder. The IFP/bladder is really there to compensate for the shaft displacing oil in the cartridge. This is actually an overlooked part of the Grip damper and how they were able to reduce friction by so much! By designing a damper that is able to recirculate fluid they were able to use a light cup seal on the shaft of the damper. You can almost look at a cup seal like a one-way seal. It has very light friction on the compression stroke yet its pressure sensitive so it seals very tightly on the rebound stroke where friction is not as big of an issue. Since the damper can absorb oil and recirculate it to the lowers it doesn't matter that the seal lets a little oil past it on the compression stroke. Compared to a cartridge with a bladder, the shaft seal has to be very tight because if the cartridge absorbs oil from the lowers it gets overfilled and pops. This is why a Grip damper, even though it has an IFP, has much less friction than a FIT or Charger damper with a bladder. If your fork feels notchy at the beginning it leads me to think there could be a tight bushing or something causing friction elsewhere. Seems like a good idea for ramp control.... Would love to see a dyna of this product against a traditional setup and a coil as well. The red line on the graph with the tokens and MRP rates was done with data taken from a dyno at Vorsprung. It's a 160mm Pike with a RUNT. What High pressure was used in the runt for that graph ? It shows the end rate to be about 250% of the rate of running 0 tokens, and in the Midrange about the same as 3 tokens is that correct? Taking my fox 36 170mm as an example I find it too progressive even running 30% sag. If I install the runt and run it with zero psi in the high chamber, you're saying it is about the same as 1 token. In that case I would have to run less pressure overall to avoid too high an ending spring rate. Seems to me this will increase sag even further as the runt doesnt have any effect until about midway through the stroke. Would you agree with my interpretation? Why is 30% with no tokens too progressive? This setup makes for a very unsupportive beginning and mid-stroke and will result in a lot of front end diving when cornering braking and descending on steep trails. In your case, I wouldn't recommend dropping air pressure with a RUNT. I would keep it the same and you would benefit from the increased support, making your bike handle much better. My forks are set at 170. If I get a 170 runt what happens should i wish to alter travel in the future? Right now we have two bodies and a stepped piston to get in between lengths. In your case you would need a 180 body with a stepped piston to make it a 170. So, if you wanted to change to 180 you could just swap out the piston. To go to 160 you would need to purchase another RUNT. With that body you could go to 150 with a stepped piston. Adjusting the cartridge size with every 10mm of travel change is important to keep the spring rates consistent to what is published. Other manufacturers claim to work at different travels with the same size cartridge, but this is not possible when working with air volume on current forks to adjust spring rates. This is why forks come with a different amount of tokens or volume spacers installed from the factory based on the length of the travel. Really appreciate all the detail into your replies! If I usually swap my air shaft from 160 to 170mm should I get the Runt in a 160 body with 1 stepped piston? Is that an option? You have it backwards. The longer the travel the shorter the runt . The shafts get longer when travel is increased so we have to make room for the longer shaft at bottom out. The 170 runt uses a 180 body with a stepped piston. The 160 runt is a longer body than the 180/170. To switch back and forth you would need two runts to keep the spring rates consistent. You may want to try the 160 first. You might be surprised the runt gives you a much better quality of travel meaning it will ride higher and have good bottoming resistance while being supple initially. The better quality of travel will make it feel like it has more travel. I have had the Runt in a Grip 2 36 for a few months now. I have previously had a fork equipped with MRP ramp control and I currently have a Lyrik with the ACS-3 conversion. The Runt is my favorite of the 3 due to its ease and range of adjustment. It is very good for tuning to a specific venue or race stage with nothing more than a shock pump. What pressure do you run in the low pressure chamber, and what is your riding weight?. Thanks. I am around 160lb riding weight and I run it anywhere from 62 to 68 psi depending on what terrain I am on. Do you mind elaborating a bit on the differences between the Runt/36 and the Lyrik/ACS-3? I am weighing options on my Lyrik (Debonair with Charger 2) right now. I know it's not apples-to-apples but the coil vs. "Coil-like" comparison is valuable. Thanks! I also have a current Lyrik with Charger 2 and Debonair. My ACS-3 swapped Lyrik has a Charger 2 as well. Those two forks currently feel very similar. The main difference is the ability to fine tune how the fork ramps up on the ACS-3 Lyrik. Based on my experience with the 36/Runt, I would definitely go with the Runt on the Debonair Lyrik as a way to gain more control over the end of the travel while improving the small bump compliance. Hopefully this answered your question. Very helpful. Thank you!! I find that my lyrik charger 2/Debonair (RCT3 btw) is very supple off the top. Where I am not super thrilled with it is the midstroke in fast, steep chunk. I have added a bit of air for support, but I am looking towards a solution like this (or maybe coil) to help improve that situation. I rarely bottom out except on the bigger drops/jump. So, I am not keen to take a token out (currently have 2).